British experts looking for a cache of World War II Spitfire planes believed to be buried in Burma say they have discovered a crate. The team has lowered a camera into the crate in the Kachin state capital Myitkyina, but says muddy water has stopped them identifying the contents. Project leader David Cundall described the development as "very encouraging". The team believes that more than 120 unused Spitfires could be buried in sites across Burma. "We've gone into a box, but we have hit this water problem. It's murky water and we can't really see very far," Mr Cundall told reporters in Rangoon, Burma's main city. "It will take some time to pump the water out... but I do expect all aircraft to be in very good condition," he added. Mr Cundall said a survey was being carried out at the site to locate any modern-day obstacles like electricity cables. He said they hoped to begin excavating within days. 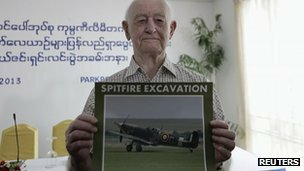 The team hopes to find about 18 Spitfires in Myitkyina, where it has been digging since last month. It is planning further excavations at Rangoon international airport, where it believes 36 planes are buried, and in the central city of Meiktila. Research suggests the planes were buried in near-pristine condition by US engineers as the war drew to a close. Finding out where they were buried has taken 17 years of research by Mr Cundall - a farmer from the Isle of Axholme, North Lincolnshire - and his fellow enthusiasts. Geophysicists from the University of Leeds have also helped with the investigation. Among the team is 91-year-old war veteran Stanley Coombe, who says he witnessed the burial of the aircraft. "I never thought I would be allowed to come back and see where Spitfires have been buried," he said. "It's been a long time since anybody believed what I said until David Cundall came along." Only an estimated 40 to 50 Spitfires are believed to be airworthy today. Mr Cundall said the practice of burying surplus military equipment was common at the end of the war.